There are many great benefits to having faster internet connection and good signal strength. However, it’s hard to achieve that with many connected devices that slow down your connection. For this reason, having a good wireless router for your home is more crucial than ever. What can help you to achieve faster and safer internet network? This is where 802.11ac routers come into play. These routers run in the 5 GHz band and can support many streaming devices, working far better than the previous 802.11n iterations. The 802.11ac routers range in size and options so they fit everyone’s needs. Let’s look into some of the best 802.11ac routers of 2019, compare them to one another and see just what makes them the best choice for your home. The key in having a faster wireless internet network is a good 802.11ac router. We all know that WiFi signal can drop when gaming or streaming HD videos, so it’s important we do all we can to prevent that. The best is to buy one of the top 802.11ac routers that are on the market. This can help you have a steady WiFi signal and internet network. As you can see, there are differences as well as similarities with these wifi routers. No doubt, the most important factor is the wireless compatibility. Precisely, some routers support only 802.11ac, while some support much more. Also, the data transfer rate is crucial because it dictates the speed and quality of your streaming and gaming. There are a few other important factors that we’ll discuss later, but for now, think about only this few. Their speed, weight and signal strength will determine how well they perform. Keep reading if you want to know a bit more about every 802.11ac router from our list as we’ll mention features, pros and cons and our final verdict. The Netgear Orbi presents the Mesh networking that’s the best new way to cover your entire home with safe internet network. This wireless router easily replaces WiFi extenders and provides safer and faster internet with better signal strength. Also, it offers up to 5000 square feet range of great WiFi signal. What’s great about this router is its tri-band technology that maintains data flow regardless of how many devices you connect to it. Furthermore, all you need is the Orbi app that helps you run the router. You’ll have all the needed instructions on your PC, mobile or Mac, so just follow them to install the wireless router. Next, it’s important to note that you can actually make a guest network that’s separate and secure for your visitors. Arguably, that’s amazing for streaming and gaming with your family and friends whenever they come over. ltimately, it operates on gg with up to 1733Mbps, and 866Mbps. On the 2.4GHz band, the router speeds up to 400Mbps. Finally, its MU-MIMO and beamforming technology offer the best WiFi signal for every connected device. Check our list of best cheap routers. Fortunately, there aren’t many complaints on this 802.11ac router. First, some customers claim that the LED light rings don’t work well and are hard to even notice. For this reason, the most customers feel like they’re actually useless. Second, there’s no way to time schedule parental control by Mac, which is something that customers often need. Of course, this isn’t really a technical issue but just a preference of some people. All in all, it’s a decent working 802.11ac router that offers great range of wireless network. It’s great if you have a large family and a big number of devices you’re looking to connect. In addition, it’s ideal for streaming as well as gaming even when you have guests and family over. Finally, its beamforming technology combined with other features is all you need to deliver internet in your home or office. We’re all familiar with D-Link and the quality of their products. As expected, this wireless router is no difference in quality and overall performance. It has tri-band speeds that are 600Mbps in 2.4GHz and 2 x 1300Mbps in gg. In addition, you get to connect multiple devices to high speed internet and enjoy HD videos and seamless gaming. No doubt, the quality in question comes from the 3x3 data streams and 6 antennas. Furthermore, the dual core processor is the 1GHz and provides you with faster both wireless and wired speeds. In the same way, the router features the SmartConnect technology and offers a large range of signal strength. Also, it’s important to mention that the router works with the advanced AC SmartBeam that brings the beamforming technology to its best and allows you to have internet throughout your home. Ultimately, the installation is easy as well as the network management from different devices such as your desktop or mobile device. If you’re looking to cover large areas, this probably isn’t the right router for you considering the customer reviews. More precisely, some people claim how the range is quite poor and you may not get the same signal strength outside the room where you keep the router. Overall, if you want to try out the new beamforming technology, this is the router for you. It provides faster wireless internet that’s ideal for playing games, downloading and watching all kinds of videos. More so, this is an 802.11ac router that will cover small spaces with great signal strength. Finally, we recommend it to everyone who doesn’t need much space range, and needs good wireless internet. Of course, design isn’t a deciding factor in this case, but it’s still an important issue that people take into consideration. On that note, this Portal router has the design that’s quite attractive and modern looking. It offers up to 3000 square feet of coverage, which is more than many 802.11ac models on the market. No doubt, the router is more than just an attractive design thanks to its quality and technology. Precisely, it features the FastLanes technology that allows you to use fast channels avoiding congested networks. In addition, the router works in 5GHz as well, and is Mesh-ready. For this reason, you can add another Portal router to your home and have 10 x faster internet, plus 3x more coverage than you’d have with only one Portal router. In the meantime, setting up the device is quite easy, and all you need are iOS or Android compatible applications. Also, it’s important to know that the router provides guest access controls as well as parental control. Luckily, there are only a few little details that people think could be better different. First, the app and the web portal don’t have the same options, which many customers find confusing. Second, most of the customers don’t like the fact that there’s an opening intro every time you open the app. Of course, this isn’t quite a major setback, but it’s time consuming and annoying according to some people. First and foremost, you can build the signal and range with two Portal routers, which can be quite convenient. In addition, the device is mesh-ready, and it’s also very easy to install and use. In any case, it looks sleek and stylish, which means it can fit in all kinds of interiors. 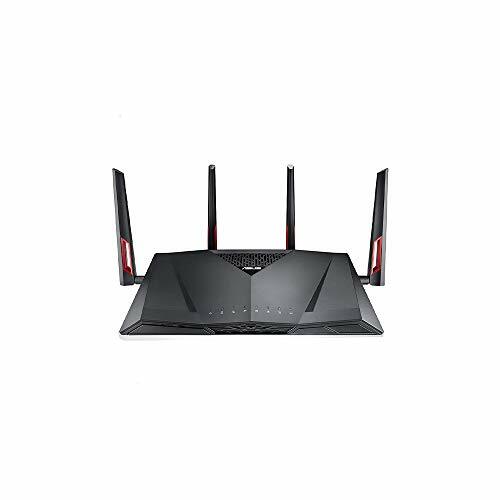 In our opinion, it’s an 802.11ac router for congested areas that will provide you with safe and fast internet network. When it comes to different activities online, it’s crucial that you have a quick connection and secure network. HD videos require ideal wireless signal, and with the 802.11ac router it’s important it works without errors. With a router such as this, you can stream and play games with ease because it delivers up to 3.2Gbps of data transfer rate. Its antennas and amplifiers deliver quality performance and internet for up to six devices. The router features a dual-core processor that has another three offload processors. No doubt, that combination is what delivers the boost of performance. In addition, its beamforming technology delivers strong connectivity for your mobile. Besides, the router has 3.0 USB port that allows easy storage access. Lastly, the ReadySHARE Vault app that comes with the router is an automatic backup for Windows PCs. For the most of the time customers were happy with how the router works. However, if the issue would appear, fixing it would become quite hard. Precisely, some people have experienced loosing connectivity to their wireless printers. In that case, someone tried to reboot the router, which would fix the issue. In addition, about 48h after rebooting, the same issue would appear again. Unfortunately, there’s not much you can do after that other than contacting NetGear customer service. There isn’t much anything special about this 802.11ac router. It works well and delivers solid signal strength that’s needed for most streams and online games. Additionally, it features all you need to do those activities without any problems. However, if you do experience some kind of issues, you’d have to find help other than rebooting because it doesn’t seem to work that well in long term. Other than that, the connectivity and overall performance showed no signs of issues. If you’re searching for a router that features parental control, and other ways of securing your network and content, this is the right router for you. More precisely, one of its best features are monitoring network activity, protecting guest networks, allowing you to create new passwords and prioritizing devices and websites. No doubt, these are very useful and convenient features that are always a plus to have. Its dual-band speed goes up to 600 Mbps on the 2.4GHz, and 1300 Mbps on the gg. On another note, you and your family can play games online, transfer files, stream videos, and much more without any problems. The external storage device allows you to share any contents easily. Plus, the 3.0 USB brings the overall performance that’s much better than the standard USB 2.0 while the eSATA brings speed to the next level. In addition to parental control, you can also use the Network Map that allows you to see the visual map of your network. Finally, you’re allowed to customize your router, which is something most brands don’t let you do. The only issue that appeared very often is performance issues with the Quick Start setup. As a matter of fact, most of the customers were unable to setup through Quick Start. Instead, most of people connected using an Ethernet cable and manually setup after Quick Start has failed. In conclusion, if you’re sharing internet with your children, or friends or guests, this is a good router for you. It’s 802.11ac and delivers faster internet connection than the most. It provides solid strength, range and performance. Plus, you get to fully customize the router, which is something most brands won’t allow even if it’s just a password change. No doubt, when you’re sharing your network, the signal can easily drop. For this reason, it’s important to have a suitable router when you know you’d be sharing your network with many other people. This 802.11ac router is one of the best ones for that. It has a total of 1.75Gbps that’s actually 450Mbps at 2.4GHz, and 1300Mbps at gg. Additionally, its dual USB ports allow you to share all media and files with ease. Also, the router allows you to set up guest network access that gives you secure wireless for guests at your home or office. Furthermore, the IP-based bandwidth control lets you easily control the bandwidth of devices that are connected to your router. Another useful feature is the one-touch WPA wireless security encryption that also has the WPS button. Overall, its features and specification make a perfect combination that allows you to use internet with different devices with ease. Only a few people said how they had problems with connecting their android devices. While internet was working on laptops, the android device was unable to connect. In most cases, what you have to do is install the latest firmware update and that should fix it. If not, however, the best is to contact the manufacturer. Simply, if you have many people to share the internet with, you should go with this router. Its data transfer rate is remarkable and the signal range is suitable for large homes and offices. Besides, you can set up guest networks and parental control just so you can keep an eye on what’s going on. Overall, the router delivers solid performance and is great for connecting multiple devices at once. Also, the Broadcom TurboQAM technology improves the wireless-N data rate to 600Mbps. On another note, its 5 gigabit Ethernet ports bring you the fast and reliable wired connections.Besides, the dual USB 3.0 ports deliver faster data transfer than before. More so, the dual core processor gives the fast and secure internet with USB devices, Ethernet and Wi-Fi. Lastly, the ASUS AiCloud service provides sync, sharing, accessing and streaming of your data regardless where you are. It also allows you to connect to other routers that are compatible. Unfortunately, the issue that often occurred is a matter of design and manufacturing. Precisely, the antennas often loose up quite after a short time of use. Customers reported that they’d lose the ability to stand upright or in any direction you’d want to set them up. Most importantly, the router is for everyone who wants fast internet, and reliable and safe network. It works well, looks good and delivers solid performance. You get to connect multiple devices and have good connectivity throughout your entire house. If you can neglect the antennas loosening after some time and losing their ability to stay upright, then this is a good choice for your home. This router brings you the 1024-QAM technology, fast internet and great coverage. Its data transfer rate is 2100Mbps at 5GHz, and 1000Mbps at 2.4GHz band. What’s really amazing is the 2.4GHz coverage that has a 4-transmit, and a 4-receive antennas. With that, the router reaches up to 5000 square feet. No doubt, this is very rare in internet routers and it comes in handy at large offices and houses. Furthermore, the router has 8 gigabit LAN ports allowing you to connect up to 8 Ethernet compatible devices. Additionally, the USB data can go up to 100MB/s while downloads go up to 1.8Gbps. The router automatically chooses the best band to connect to using its smart connect feature. Most importantly, the overall experience is safe thanks to the ASUS AiProtection that ensures you’re secure when you’re online. We weren’t able to find many things wrong with this 802.11ac router. However, a few people said how the beamforming band at the 5GHz is slow and doesn’t work as well even when you’re standing close to the router. No doubt, this is an important issue and many people see it as a major setback. In our opinion, if this happens, the best thing to do is contact the manufacturer. No doubt, this is one of the best routers that support 802.11ac and can cover large areas, homes and offices. Its data transfer rate is solid, and you can easily download, stream and play video games. However, if you experience any issues with beamforming at 5GHz, you should contact the manufacturer in order to fix the problem. Having a router that supports 802.11ac and has a dual core processor is important if you want fast connection and good performance. In this case, the processor is 1.7GHz and delivers the outstanding performance and safe and secure internet. Its 4x4 802.11ac wave and MU-MIMO bring you almost 2.53Gbps of wireless speeds. Additionally, the Smart Connect feature gives the seamless transition, smooth streams, data transfer, gaming, etc. Furthermore, the Layer 7 traffic control is hardware accelerated and allows you to monitor your network. Apart from supporting802.11ac, the router also has dual WAN that balances loading and failover support. More often than not, the router didn’t connect well with USB printers. Sadly, there isn’t anything you can do about it because that’s how the manufacturer made the router. Precisely, the Synology support claims they’re only compatible with a small list of printers that you can find on their website. Only if you don’t have a printer, or your model is on the list of printers supported, this router is a good choice. Its features and abilities to connect and maintain signal strength is great, but the minor setback is that you maybe won’t be able to connect your printer. On another hand, the range and speed are suitable for most homes and multiple devices. Fast file sharing is crucial to many people so it’s only normal that we include this amazing router in our list. It supports 802.11ac, and has the amazing data transfer rate of 2334Mbps. This is brought to you by the dual band, allowing you to enjoy UHD/4K videos and play online games. Also, the 4x4 MU-MIMO antennas with AiRadar beamforming give the remarkable performance and signal quality. In addition, the router features a USB 2.0, as well as a USB 3.0 for fast data transfer and USB storage. Most importantly, the AiProtection byTrend Micro brings the ultimate network security and parental control. Finally, this 802.11ac model features the ASUS AiCloud 2.0 that allows you to access, share, sync and stream files anywhere and on any device. In most cases, the router proved to work well. However, some people experienced a similar issue that happened to other ASUS routers and that is the 5GHz band often dropping. Fortunately, you can fix the issue by updating the firmware. Nonetheless, if you experience the same problem again, you should definitely contact the manufacturer. The issue that we’ve stated isn’t a rule and definitely didn’t happen to many people who use the 802.11ac router. Naturally, devices can have errors, so it’s only normal those things happen. Overall, the router is great, supports 802.11ac, allows fast download and upload, and is reliable and secure.